20 | January | 2013 | Crappy Kitchen - Good Dinners! When it comes to fried foods bathed in a crispy coating, the Japanese have everyone beat! Whether it is the delicate batter called tempura, used when deep-frying vegetables and seafood, or the light as air bread-coating pressed onto a pork cutlet or firm tofu, the culinary prowess of this East Asian country surpasses all other cultures I can think of. It is no wonder the rest of the world has discovered panko bread crumbs, including yours truly! I’m on this mission of trying to make tofu taste like fried chicken, and the panko crumbs on this tofu I prepared the other night was amazing, so good in fact, I decided that it shouldn’t have to taste like chicken when it tasted so good just being tofu! 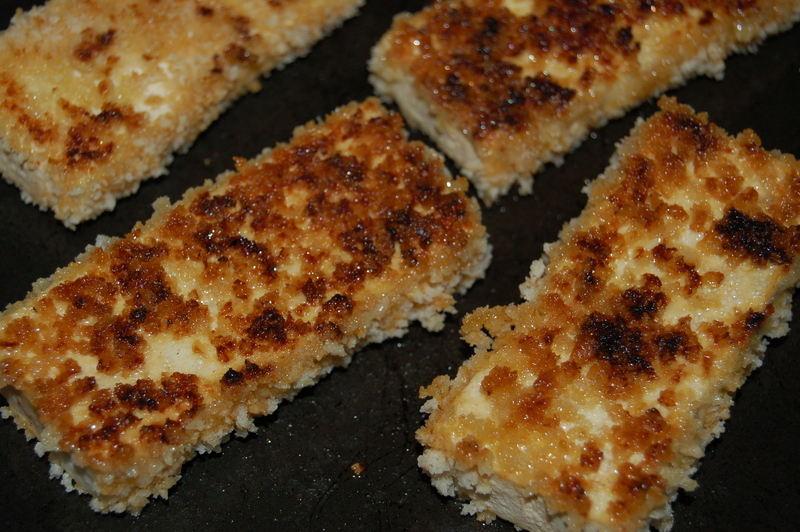 Panko crumbs are light, flaky dried bread crumbs that the Japanese so cleverly invented to coat things like a meat cutlet and fish before it is fried. This is strange science to me and I don’t know how it works, but they pass an electric current through the dough and this magically (well, it’s magic to me) produces an airier texture than you can imagine. It becomes so crispy it repels the hot oil it is quick fried in, and seals in the juicy flavors. Well, it certainly worked for my tofu and paired with my newest and most favorite lettuce, escarole, this was a complete me that satisfied all of my taste buds, from sweet to umami! 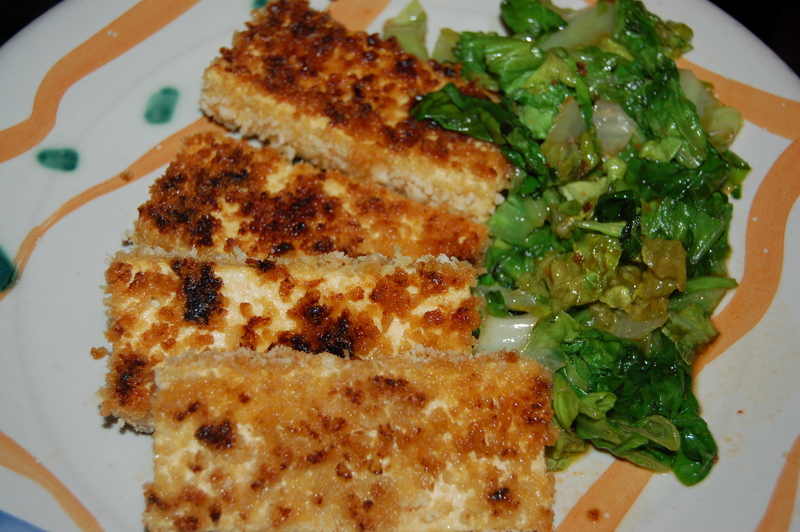 You have to make this and be wowed by the crispness of the tofu and the delicate flavor of the wilted escarole. 1 block firm tofu, (blocks usually come in 12 oz unit, 350 grams) pressed, (see pressing method here) and sliced into 8 pieces across the shortest side. 1 – With a fork, whisk the egg with 1 tbs each of hoisin, mirin and soy sauce in a large shallow bowl (you will be using the mixture to dip the tofu into, so it needs to be big enough to coat the tofu slices easily). Set aside. 2 – Put the flour and panko crumbs on two separate dinner plates. 4 – Place large saute pan on medium/high heat and add the oil. 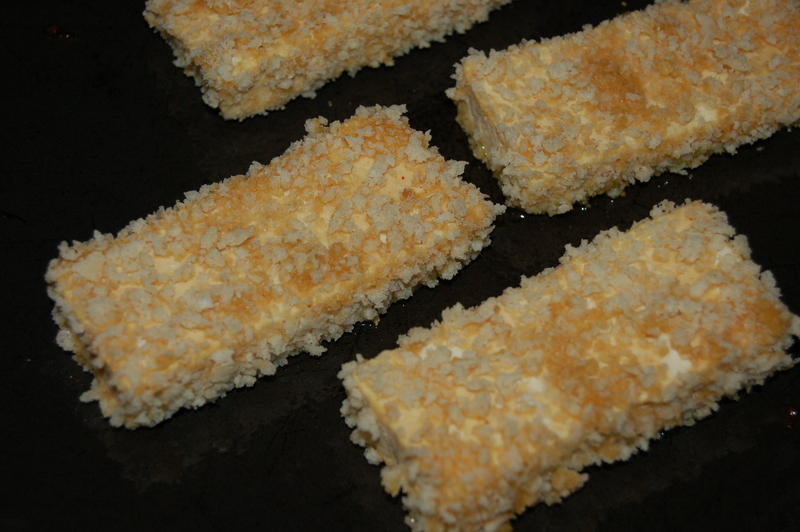 When it is hot add tofu in a single layer to the pan (you may need to do this in two batches). 5 – Fry undisturbed for about 2 or 3 minutes. Turn and repeat until both sides are a nice crispy brown color. Remove to a plate. 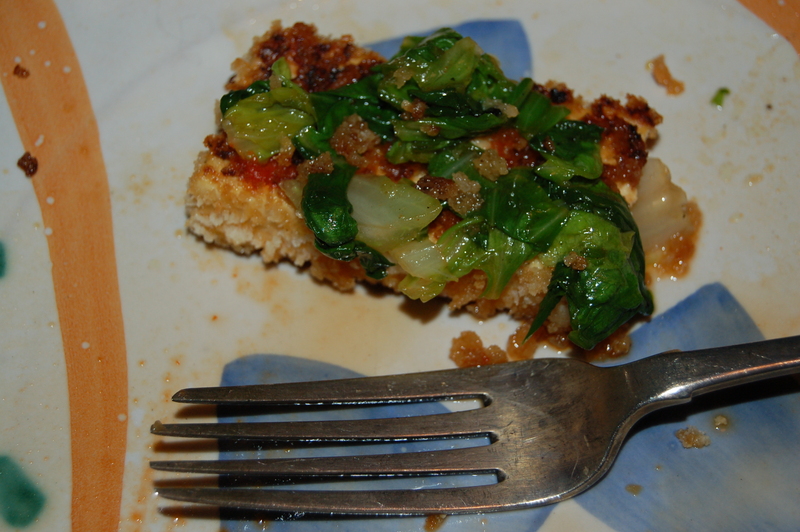 6 – Immediately take hot pan off of heat and add chopped escarole. It will wilt almost instantly. Sprinkle about 2 tbs of the soy/mirin mixture over the escarole and mix very quickly. Turn onto a plate if serving as an appetizer or waiting serving plates for main course. 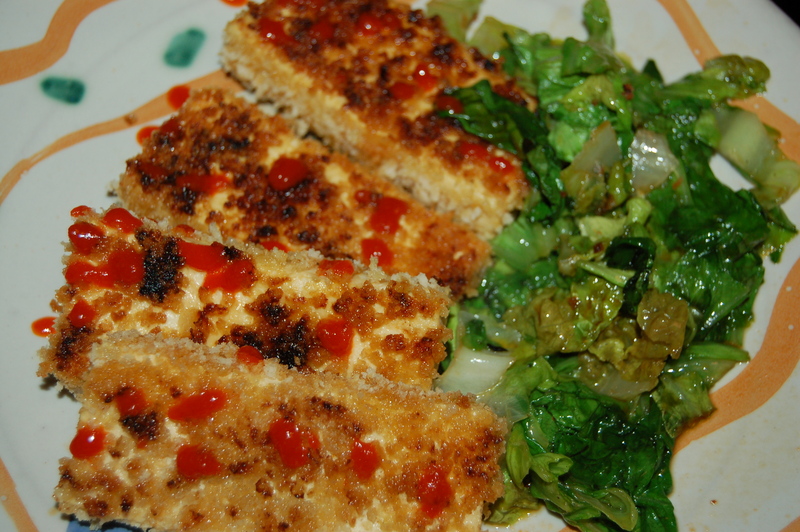 Serve tofu with a little hot sauce if you like an extra kick. 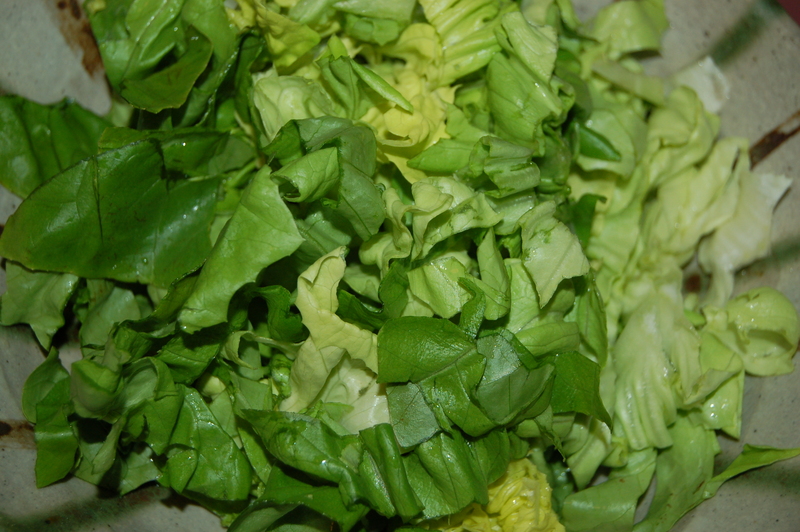 If serving as an appetizer, place the escarole around the border of a platter and arrange the tofu around the escarole, and place a bowl with the remainder of the sauce mixed for the escarole in the middle. You can make up more sauce if you like by adding equal parts mirin and soy sauce.